2014 has come and gone, and now American University Blue Crew Leadership Council (BCLC) is adapting this motto of moving forward and transitioning into 2015. We don’t know what this new year may bring, but we know that our team has big dreams, new goals, and high hopes for 2015. "I'm not the biggest believer in setting resolutions just when New Year's comes around. I firmly believe that every day we should be setting goals to not just better ourselves, but assist others. However, in 2015 I look to continue what I started when I first came to AU, which is to garner a stronger sense of school spirit and pride by connecting with our diverse campus community. I hope to remain highly optimistic and positive no matter how hard times may be and to spread that attitude to everyone around me. I cannot wait to live, laugh, and love even more, not just by myself, but with everyone in my life because life is better lived in the company of others. Oh, and to all my peeps out there remember to always wake up every morning believing your flawless, treat yo self whenever possible, and be fearless in everything that you do!" "To bring happiness to the people around me." "Eat healthier and cheer on AU!" "Never miss an AU Basketball game." "My New Year's resolution is to do really well in school and manage my time properly. I'm also going to start using a planner and try to stop pulling frequent all nighters." "Stop putting the happiness of others before my own." "Bring down my timed mile by one minute and put on a positive/happy face for everyone I interact with even if I'm stressed or in a bad mood." "2014 was a great year however, I am happy that it is over an I can start a new year on a clean slate. This year I am studying abroad in Australia and have two main new years resolutions: Try something new and don't make empty plans. This encapsulates everything that I want to do this coming up year. I no longer want to be a person who does everything last minute and is stressed out 24/7. Instead I will plan ahead, allowing more time to explore Australia. I will make plans and go threw with them and I want to be open to everything new that comes into my life in the future." 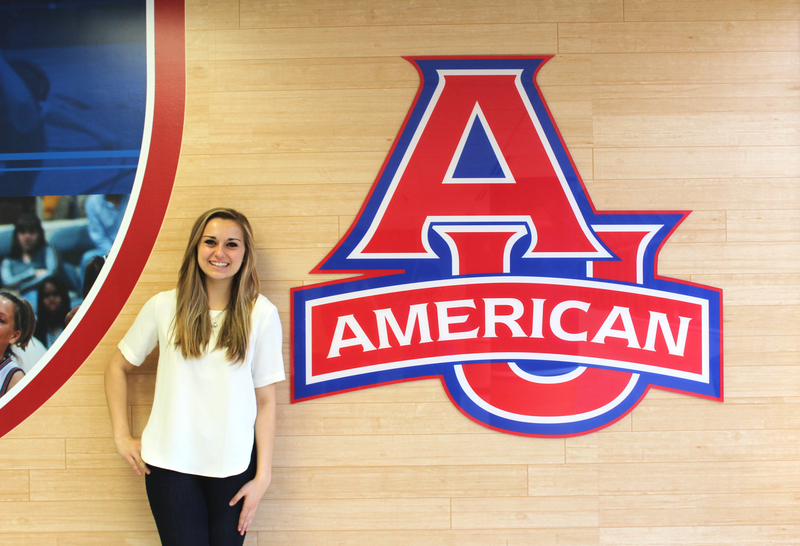 "I want to work harder in the gym and be more active in getting people involved with AU Athletics." "My New Year's resolution is to dedicate more time to volunteer work, helping to tackle major issues such as hunger and illiteracy in my own community." "My resoluton is for the student section to be packed and rowdy at every basketball game, men's and women's, for the rest of the season. Every fan in attendance should invite at least 5 people to join them. Also, when the oppostin team is shooting free throws we should engage our inner eagle and caw obnoxiously." 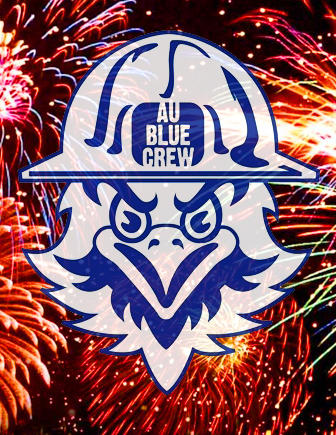 As we move forward into 2015, Blue Crew wants to hear more from you! What are your goals for 2015, and how do you hope to go about accomplishing them? Sports Multimedia Journalist. As a passionate writer and self-proclaimed nerd, Lillian is known for being the first to volunteer to edit someone's paper before it's due and is certain she's AU's resident diehard Star Wars fan. She has worked for Tb-Two*, a weekly newspaper published by the Tampa Bay Times, where she was a staff writer and social media moderator. To be honest, I was nervous going into Wednesday’s game. The men’s basketball team had a record season last year, but that didn’t necessarily mean that the school spirit and energy from the crowd would carry over. Now that everyone’s back on campus, this game was really going to show whether AU fans would come out to support the team no matter what. I was very happy to see that they did. As someone that sits on the side of every single home game, I’ve seen this team play under a lot of different circumstances. Let me tell you a little secret, they really do play better when there are more people in the stands. They thrive under pressure, both from the other teams and from the fans. Need proof? Saturday’s intense double overtime. Jesse Reed’s outstanding statistics on Wednesday (seriously, WOW he was on fire). Pee Wee’s buzzer beating three-pointer. These guys turn it on when things start to go wrong, and they feed off your support. So please, keep coming out to games. It’s a “the more the merrier” type thing. When the stands are full, students get more excited, the dance and cheer teams have more fun and the players feel the encouragement. Hopefully, with enough cheering and chanting, we can turn these close nail-biters into easy wins. 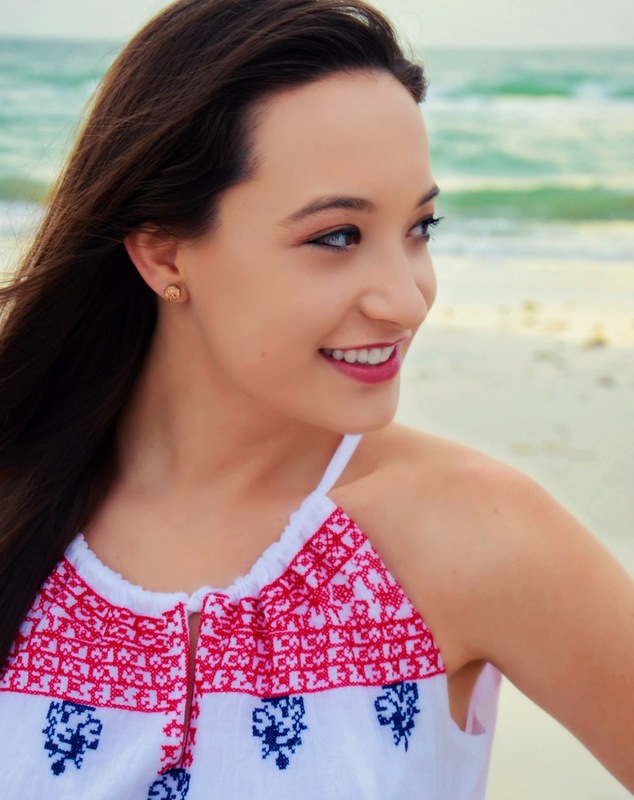 About the author:Madison Hayes is currently a junior at American University and a major contributor to school spirit on and around campus. Along with being a Sports Multimedia Journalist for AU Blue Crew Leadership Council, she is a captain on the AU Dance Team! 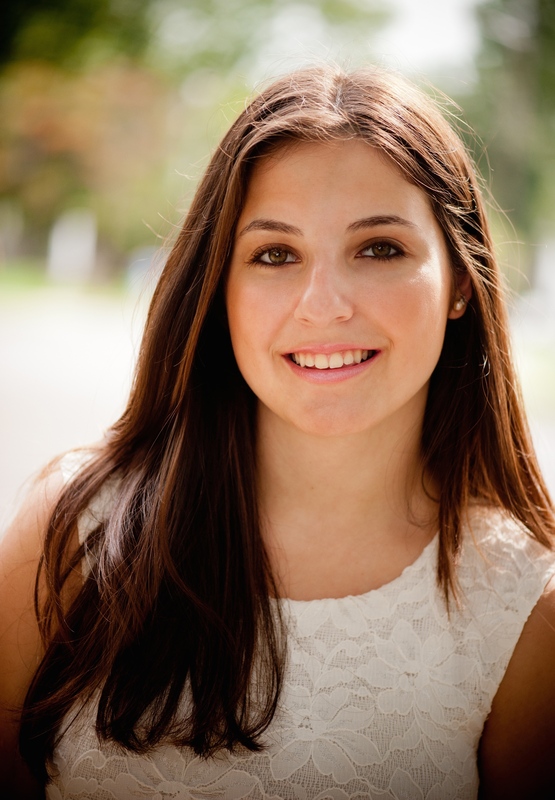 Madison is also a Jumpstart tutor, Latino Student Fund tutor, and mentor in the honors program. The 2000 fans who attended the American vs. Army and American vs. Navy games on Monday and Tuesday night were treated to a Patriotic fan-fest like no other. I work for the Athletics Communications Department, which means that during basketball games I’m either sitting courtside running statistics to coaches and the media at each time out, or working behind the scenes in the AV (audio/visual) room scrambling to create graphics for the online broadcast (still learning how to do that). The American versus Army game was the first AU athletics game I was able to attend as an Eagles fan since Bender Blue Out my first semester, and, like so many other students who had the chance to attend, I had a blast. Over 1,600 people filled Bender to enjoy free food and drinks and cheer on their favorite teams. The crowd was electric--Blue Crew lined the fan section cheering for their home team--but Eagles fans had some competition. Army’s fans, a crowd practically singlehandedly directed by a passionate Army fan, was a formidable rival. Clawed the Eagle joined in the fun, tousling fan’s hair, greeting young fans, and posing for selfies. I’ll never get over the thrill of taking a picture with Clawed--pictures with the school mascot are great momentos to look back on. His reactions to the Eagle’s baskets are priceless, and his dance moves are killer, so be sure to keep a look out for them at the next game. I was at the game with a few of my friends, and, like Clawed, we all did our fair share of reacting to each play. We were torn between screaming, cringing, and cheering at each and every play, and the game kept us on the edge of our seats. AU fought valiantly, but Army ended up pulling ahead of us in the last few minutes to win the game. The women’s game against Navy on Tuesday night was just as intense. Instead of slowly battling it out with Navy, the Eagles held nothing back. The women’s team never ceases to amaze, and the Eagles came out on top with 59-49 over Navy. Both games were Greek and Club Sports Challenge events, and I was there with some girls in Alpha Xi Delta and some other new members. Members of other sororities, fraternities and club sports teams came out to the games to help earn points for their organization. 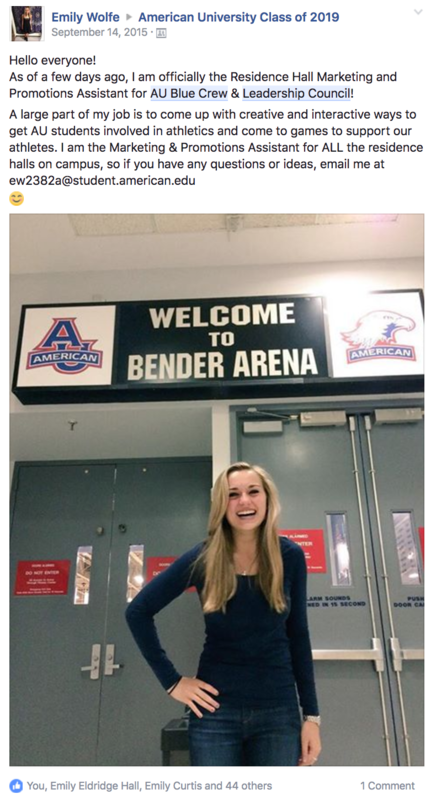 I believe that the presence of the 2000 fans who filled Bender Arena on Monday and Tuesday night spurred the American University Eagles on to playing harder. I’d encourage all students to support the teams. Even if you’re not a big sports fan, AU basketball games are never a disappointment and are sure to leave you bubbling with school spirit. 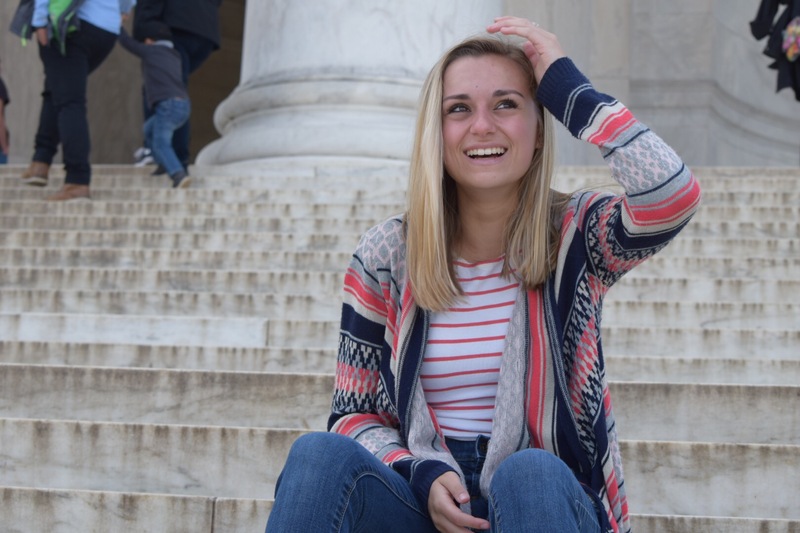 About the Author:Lillian Skye Noble, a first year student at American University contributes to AU Blue Crew Leadership Council as a Sports Multimedia Journalist. As a passionate writer and self-proclaimed nerd, Lillian is known for being the first to volunteer to edit someone's paper before it's due and is certain she's AU's resident diehard Star Wars fan. She has worked for Tb-Two*, a weekly newspaper published by the Tampa Bay Times, where she was a staff writer and social media moderator. Now that Super Bowl Sunday is behind us, we can all focus on the next exciting sporting event: The Sustainability Awareness AU vs. Loyola game! This is a chance for the AU Eagles to really show who is the “greener” school. If we win this game, our average wins will go up and everyone, except the Greyhounds will be extremely happy! Well, what makes this game so special? Besides, of course all of it’s competitive nature, this game is actually dedicated to being sustainable and more eco-friendly. Ask any of the basketball players, they know what we are talking about! We all know that AU is considered one of the greenest schools in the country but we also know that a big part of being sustainable is spreading awareness and making individual change and impact. Thus, the game will consists of many fun activities that are directed towards making that change. At the end of the day, we all live on this earth together and it’s on us to make it greener and beat Loyola! It’s official! The AU women’s basketball team will not be playing in the First Round of the Patriot League Tournament on March 4th, but certainly not because they weren’t good enough to make the cut. Word hasn’t exactly been spreading around campus, but the Eagles earned a well-deserved bye through the first round for their impeccable 13-2 conference record. Clearly these girls are on fire. With an overall record of 18-8, it’s honestly shocking that they played most of their games this season with barely any fans in the stands. Especially at a school with a student population that is well over 50% female, that prides itself on its curriculum emphasizing gender equality and that praises accomplishments of women in the workplace, it just makes no sense. We should praise the accomplishments of women on the court too. It’s not too late to change the trend though. The girls play tomorrow against Army at 1 pm. Can’t make it? Senior day is next Saturday February 28th at 4 pm. The Quarterfinals will be played at Bender at 7 pm on March 6th. The girl’s team is like AU’s best-kept secret, our hidden weapon. Well, let’s not hide it any longer. It looks like we’ll be finishing out the regular season on 2/28 the same way we started it (for those of you that can remember all the way back to November), with an Eagles double header. The men’s team takes the court at 12 pm and the women start at 4 pm, but Saturday will be about so much more than the games themselves. Blue Crew is going all out to make sure AU fans will remember these last two games of the regular season. Student organizations and clubs have a chance to win a $300 raffle, and $150 each for the most spirited poster and social media photo (Make sure to included #ClawedLovesClubs and specify what organization/club you represent)! 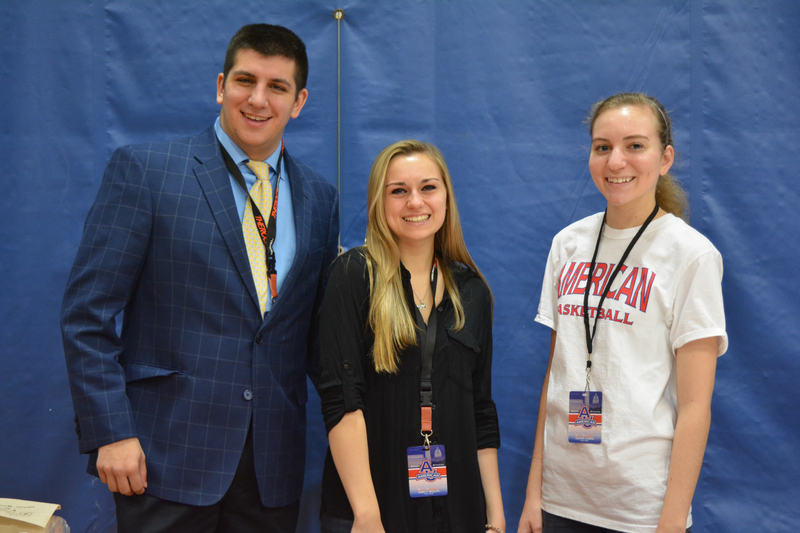 Also, the annual presidential shoot out will be held between AU President Neil Kerwin and AU Student Government President Sophia Wirth. And there will be a performance by the AU African Dance Team AND the AU Dance Team, you’re not going to want to miss these games. But personally, I am most excited for Saturday because it’s Senior Day. 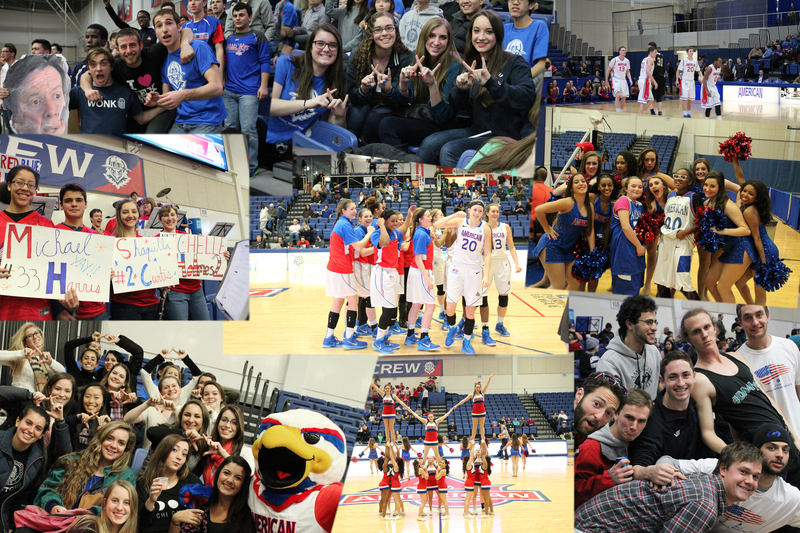 Soon-to-be graduates from both the men’s and women’s basketball teams, cheer and dance teams, and pep band will be honored during the games. For four years now, we’ve watched Pee Wee Gardner, John Schoof, Kevin Panzer, Kyle Kager, Jen Dumiak, Shaquilla Curtis, and Arron Zimmerman give it their all on the court. We’ve watched Cynthia Rodriguez, Lauren Mabie, Samantha Hogan, Lori Interlicchio, CJ Murphy, Marlo Bloom, and Jessie Hirtenstein perform spirited timeouts and halftimes. Of course, we can't forget pep band seniors Dane Eun, Zach Kopin, Corey Parks, and Marissa Gargano who help add spirit and energy to every game. I think it’s safe to say that these seniors have grown to think of Bender as a second home, but I’m even more positive that none of these teams will be the same without these dedicated ladies and gentlemen. Friday, October 2 was my first time photographing and covering a game as a Sports Multimedia Journalist for AU Blue Crew Leadership Council. Little did I know it would be an experience that would have me hanging on the edge of my seat. The fans in the crowd were not the type of people I expected to see at the game—they did not slouch in their seats or look like they wished they were somewhere else. These fans were ecstatic to be living in the moment and taking a break from technology during all three sets that were played. After I finished taking pictures, I joined the crowd of sports fans in the bleachers. I sat with a friend who was visiting from out of the country and had never been to a real college sports game. She watched me as I took notes to highlight all the action that was happening around us. There was a certain sparkle in her eye as she watched the game that matched the enthusiasm of everyone else in the room. Each time a point was given to the AU Volleyball girls, the crowd went wild and stood up to cheer. We won in three sets without hesitation, which led us to our victory against Army. It became apparent to me that there were not as many student organizations in the crowd as perhaps a basketball or soccer game. There was a point when I was a freshman in my second semester when I felt I became too busy to see a game. I do remember seeing different Greek organizations filling the bleachers at basketball games. We all have busy schedules but it is important to remember how exciting and relaxing a sports game can be after a long week in classes. 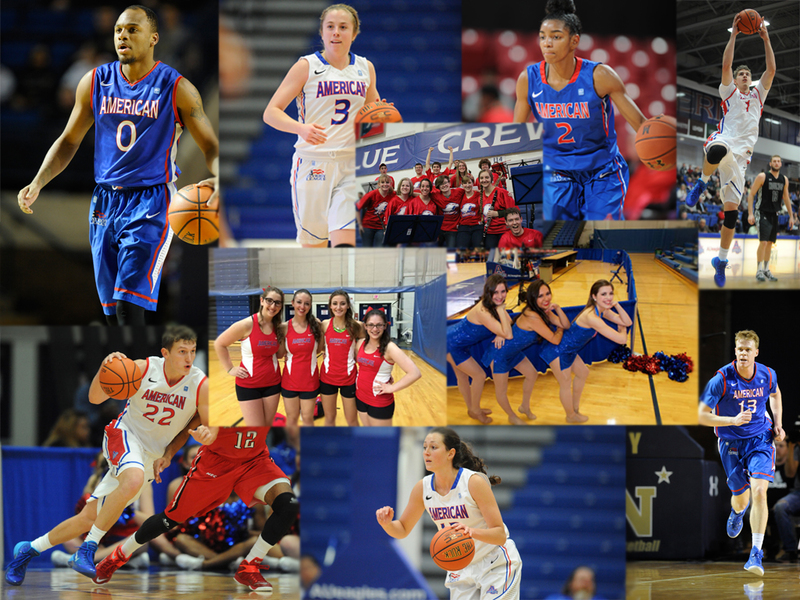 American University students have pride, and its time we bring that back to the courts and fields. 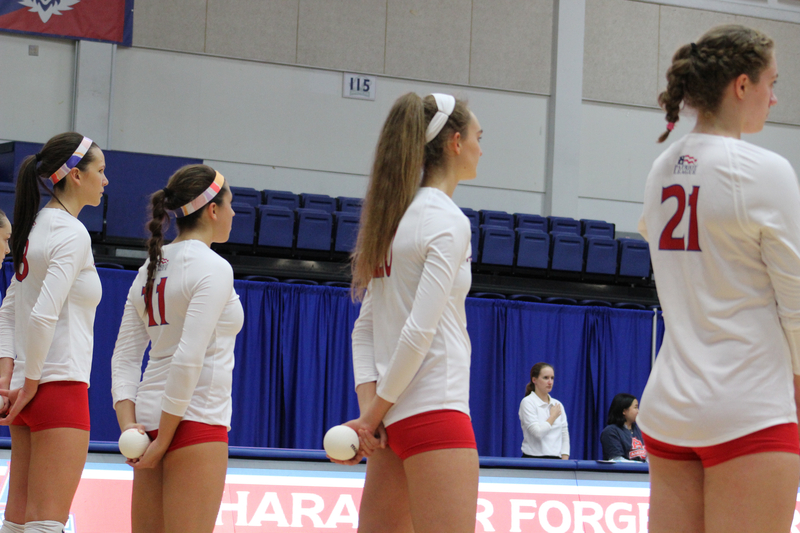 **This blog post was created on October 2nd and since then AU Volleyball has won 5 straight matches and currently has a 16-5 overall record and an undefeated 8-0 record in Patriot League play. in Social Psychology with a minor in Communication. She is not only a Sports Multimedia Journalist for AU Blue Crew Leadership Council, but also a dedicated sister of Alpha Epsilon Phi. Rebecca has a twin brother, and a younger brother and sister who are also twins, and she loves all of them dearly. Her interests include marketing, sports, public relations, and fashion. While she also enjoys traveling in and outside of the United States whenever the opportunity arises. 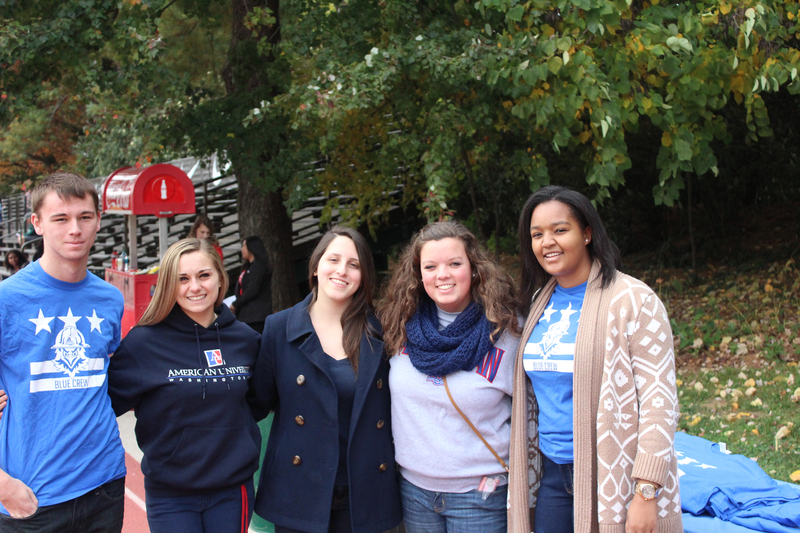 My first encounter with American University Athletics and Blue Crew was April 15th, 2015. It was my “Freshman Day” before classes started in the Fall, and we were given free time to roam around Bender Arena and check out the tables that were set up for different clubs and organizations. After walking around for a bit, I gravitated towards the Blue Crew and their Leadership Council (BCLC) table. This is when I first met Benjamin Zenker, who would later become my boss as well as my friend. Ben explained the workings of Blue Crew and their Leadership Council, I was immediately intrigued and knew I wanted to send in an application. Ben and I kept in touch that summer and I sent in my application for a position on BCLC as soon as I could. When I got it back, I was given the position of Residence Hall Marketing and Promotions Assistant. While this was my official title, I also appeared at every game day to help out as much as I could. Being the Residence Hall Marketing and Promotions Assistant meant that I had to find creative ways to get people living in residence halls more involved with AU Athletics. It was a tough, although not impossible job. I spent much time creating big posters to place on or near the front desks of residence halls, and attended many meetings. It was my first collegiate leadership position and I did everything in my power to do well and make a name for myself. Throughout this process I met so many wonderful people. I was an intimidated freshman in an organization full of upperclassmen. I am so fortunate that I met Abby Lore, Luke Barr, Shaina Spector, and Olivia Carini. Not only were they all instantly kind to me and extremely inclusive, but they actively made the effort to be friends with me outside of work. To this day I consider myself so lucky to have met them and still know them. Working alongside them was one of the greatest privileges I could have had. A few months in to the job, Ben informed me that he would be stepping down. Since he was President of the organization, this posed as a problem. Where would BCLC go without leadership? Who would coordinate anything? Who would rally everyone together? As all these thoughts were rushing through my head, Ben told me that he would be appointing me as President. Me. Small, freshman, frequently-too-nice-to-people me. With every doubt in my mind about myself, I accepted Ben’s offer. I began my job as President of BCLC a few weeks after Ben gave notice to everyone. Ben and I did a photoshoot for it, and The Eagle even wrote an article about it (Building A Family Within Blue Crew). These events leading up to it made me very excited. As I began working as President, I quickly realized how many things I had to juggle at once. It was difficult, but extremely rewarding. I realized how good I was at managing a team, rallying people together, interacting with fans, and finding quick fixes when things went wrong. I enjoyed everything about the job. From every game to the seemingly endless meetings, it was like I couldn’t get enough. I even liked the fact that I was given a walkie-talkie for every basketball game, and there was always a script waiting for me with my name written at the top. I especially loved that I worked with very dear friends. I loved being a leader because AU BCLC made me feel like I could do it. I am now a part of the AU Athletics Internship Program. Ben is my boss once again, but this time I am a Program Manager and he is a full-time staff member as the Assistant Director of Ticket Sales and Marketing. This position is still new to me and I am still finding my way, but my entire experience has been nothing but rewarding. I know that with this internship my opportunities will do nothing but grow, and I will learn so much more along the way. If you are interested or have questions about the AU Athletics Internship Program e-mail me at ew2382a@american.edu and I'll be more than happy to help!